Due to the commitments of my external examiner, my viva was scheduled some four months after the submission of my thesis. Although initially this felt like an enormous wait between submission and examination, this gap allowed me to take a proper break from the thesis. I did not look at or think about the thesis between the end of January (when I submitted) and the end of April. This proved hugely beneficial as it enforced distance between myself and my work and made coming back to it at once more pleasant – in that I rediscovered the enjoyment my work brings me (difficult to hold on to in the lead up to submission!) – and more effective – in that I had gained some degree of objective distance from my work. After a break, I eased myself gently into viva preparation by spending a couple of weeks reading and watching material relevant to my work that for one reason or another I felt I needed to revisit. This included films that I had mentioned tangentially in relation to my case studies and key themes but that I had yet to watch in their entirety. This also included relevant material that had been published either in the latter stages of writing or since submission. I continued doing this right up until the date of the viva. This allowed me to re-familiarise myself with my field and not necessarily just the texts cited in the thesis itself. Familiarity with your research area is an important aspect of scholarly development that is important to demonstrate in the viva. Seek out others who have recently sat their viva as well as others who are about to sit their viva. Hearing about others’ experiences can be nerve-wracking but it can also prove useful. A Twitter acquaintance of mine, Dr Emma Walker, proved a great source of support and solidarity as she was also preparing for her viva at the same time. Although we are in completely different fields and disciplines, just sharing tips about how we were preparing was highly useful. I also spoke to several of my friends who had already gone through the process and got their advice and experiences. I underlined key sections as I read. I took extensive notes in a Word document which served as an outline of my main lines of argumentation. I tried to put myself in the position of my examiners. What would they want to ask me having read this piece of work? I jotted down, again in a Word document, areas I thought I might be questioned on/might have to defend. 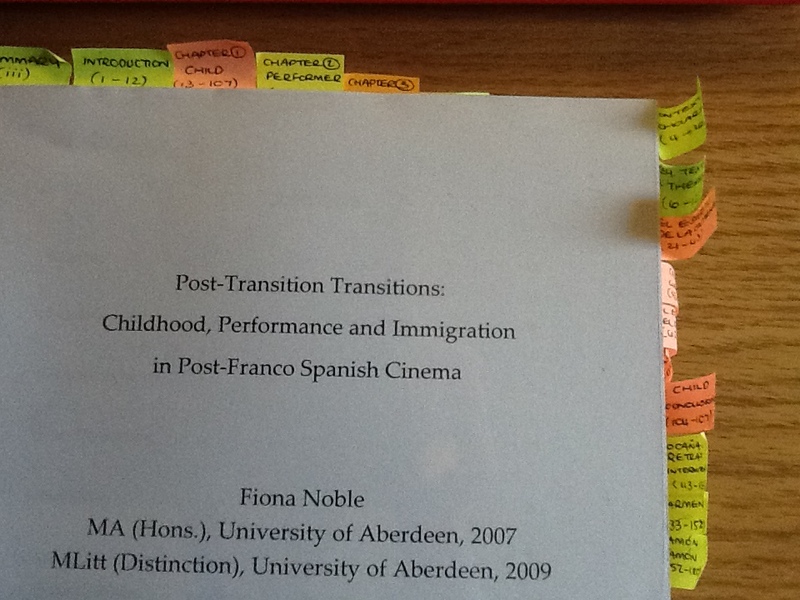 Just before the exam, I also added post-it markers to each of the chapters and sections of my thesis so that I could easily locate relevant sections during the viva (Figure 1). In addition, I placed post-its at the start of each chapter and sub-section with bullet points containing the main lines of argumentation in each section. While this did not prove overly helpful – I don’t remember opening my thesis once during the viva! – I think the process helped me get the main thrust of my arguments back into my head. It was also a comfort knowing that I had that as back-up during the viva if I were to go blank!! Ryder, Nathan. Fail Your Viva: this digestible manual makes for light-hearted reading, which I certainly appreciated amidst the stresses of viva panic! This book is packed full of useful hints and tips to assist your viva preparation and I found it very helpful indeed. What’s more, it’s dead cheap on Amazon. I also recommend listening to some of Ryder’s “Viva Survivors” podcasts for individual accounts of viva experiences. Dunleavy, Patrick. “Top ten questions for the PhD oral exam”: I gleaned some of the viva questions I used for practice from this article, which is adapted from the book Authoring a PhD. A very useful starting point for thinking about what sorts of questions you may be asked. Murray, Rowena. The Viva: this helpful guide breaks down what to expect from the viva and how to prepare for it. Also provides a handy checklist for how to prepare and when, which I used as part of my preparations. As a language student at heart, I love a flashcard. 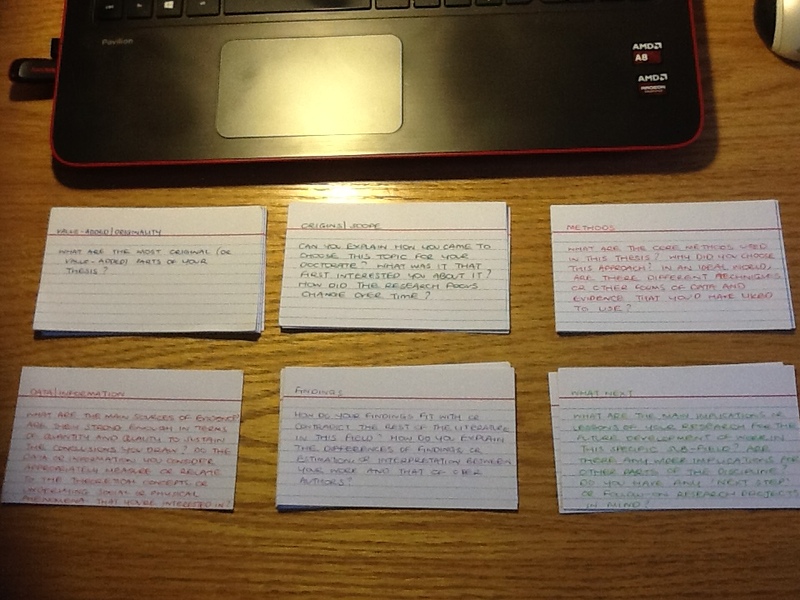 Preparing viva questions gave me the perfect excuse to get my index cards and multi-coloured pens out. I made a set of colour-coded flashcards, to which I added as I read various sources on the viva experience (see point above). On the front of each card, I wrote the question and the category to which the question belonged (value-added/originality; origins/scope; methods; data/information; findings; what next; external examiner’s questions). On the back of each card, I jotted down some notes as to how I might answer the question. I must admit, I did not write much on the back of the cards as I did not want to fall into the trap of memorising answers to questions. I wanted my responses to be more fluid and tailored to the exact wording of the question as it might be put to me by my examiners. I practiced answering the questions on a regular basis, recording my responses on a Dictaphone so I could listen back to myself and reflect on what I expressed well and not so well. My supervisor was kind enough to volunteer to provide me with a mock viva, which I found hugely beneficial. We opted to have our practice session 10 days before the main event, giving me sufficient time to prep in advance and afterwards, should there be anything major I’d missed. The mock really helped to boost my confidence as well as giving me an idea of what to expect on the day (although that was completely different!). My supervisor is the one of the most warm-hearted and encouraging people I know, both within and beyond academia, and she really helped to put me at ease in advance of the big day. She alternated between asking me viva questions and offering advice as to what I did well/what I could have done better. After the mock, I typed up my notes and thoughts and I used this as part of my ongoing prep.A week after this and just a few days before the viva, a friend (who passed her viva a few years back) put me through my paces with another mock viva. She did not pull any punches. She had a plethora of questions for me and she drilled me for around 3-4 hours. It was intense and exhausting but it forced me to think about where the gaps might be in my viva prep to date. I really appreciate the efforts she went to and the experience was definitely useful in the run-up to the big day. I had told a wee white lie about when my viva was taking place. Or rather I had lied by omission – my family and friends all thought that it was taking place a few days later than it actually was, on the date it had originally been scheduled. I decided not to tell anyone (except for my husband and my friend who gave me the mock) and that certainly took the pressure off. (It also meant I got to surprise them all with the happy news that I had passed the viva. )I did not do any prep the two days immediately before the viva. I think it’s important to take time out and try to relax in advance of the event. Do something fun. Go to the cinema. Bake. Whatever it is that takes your mind off things. Sleep. Rest. You’ll need all your energy for the big day!! So there you go. That’s what I did to prepare for the viva. It really is a case of finding what works for you in terms of preparation and doing what you need to do to feel as comfortable and as confident going into the examination as you possibly can. It is a unique experience and it’s difficult to know what to expect. But following these steps certainly helped me on the day. To follow this, I’m planning to write a post on my experience of the viva – here’s hoping it doesn’t take me another five months to get around to writing that! Good points, key elements which hopefully can help me when my time comes.